If you have ever seen British plans of warships you may have noticed that the armor thickness is often shown in lbs instead of inches. Well, for those who don't know this, 40 lbs = 1 inch. This 24.9 mm equivalence applies only to the thickness of metal plating. The British 15-inch gun is obviously 381 mm, not 373 mm. Thanks Jose - that's very useful information. I've known, but I keep forgetting the conversion and I didn't know about the British "inch". I think that there is a number rounding issue here: a 1 foot square 1 inch thick plate doesn´t weight exactly 40 pounds, but 40.85 pounds, taking a metric density of 7.86 for the steel. So a plate 1 foot square which WEIGHTS 40 pounds, is not 1 inch thick but a little less, 25 mm for the same density. I must conclude that the inch used for the plates is 25.4 mm as in the guns, but it is the plate which is not exactly 1 inch thick. Correct; British plate was actually specified by weight in multiples of 40-lb (per square foot), not in inches, although plates were generally described as so many inches thick on the basis of one inch thickness = 40-lb/sq.ft. The equivalent weight of an inch thickness was 40.8 lb per square foot. Either (or often both) the weight or "nominal" thickness would be used to describe the plate in documents; for example in one document I've seen three plates listed as "12 inch" plates but immediately afterwards described as "480 lb (11.76 in)". Trials reports sometimes list actual thickness and sometimes nominal thickness. There would of course be a small manufacturing tolerance as well, I've got a copy of some 1914 trials of 520-lb plates where the actual thicknesses range from 12.64 to 12.8 inches. For comparison, US plate was specified in inches thickness with tolerances of +/- 0.25 inches appearing in trials reports so a nominally 13.5-in plate would be 13.25 to 13.75 inches thick; other navies would have had their own standards. The 24.9mm inch in British use is well documented for all thicknesses above 6in. The issue for thinner plates has not been nailed down quite as comprehensively. This would also apply to Japanese design up to about 1920 (I forget the exact year). And the use of this conversion certainly doesn't mean that anybody is -- or ever was -- using "special" inches. 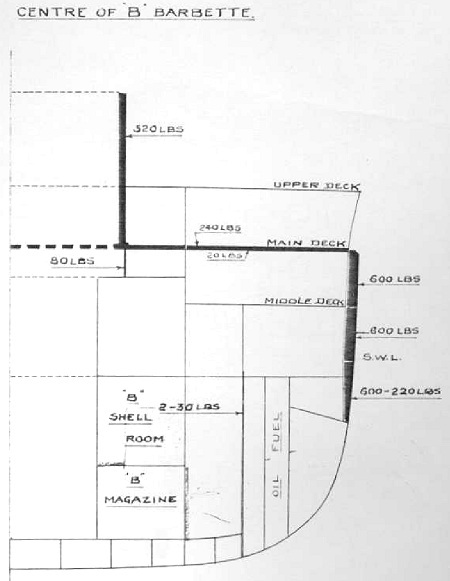 Armor is heavy, usually priced by the pound, and naval architects must be very careful with weights, so some navies tended to issue specifications for armor (and other plating) in pounds per square foot measure. They would therefore tend to round thicknesses off to the nearest even pounds value, e.g. 400 # plate would actually be 400/40.8 = 9.80" thick. Other users, more concerned with geometry, might let the inch thickness drive the system instead and ask for 10" thick plate. If that were the case, rough useage would convert this as 10" x 40 = 400# plate, but that's just an approximation, as the real weight would be 10 x 40.8 = 408 lbs per square foot. Those unfamiliar with shipbuilding practice -- including the authors of many secondary textbooks -- often didn't differentiate too carefully, and often used the approximate 40# p.s.f. = 1" thick conversion as though it were strictly correct. But that's just sloppy conversion, not an example of any special inch being used. The correct way of approaching this is not to assume the use of some special inch for armor thicknesses, but to realize that armor plate does not actually weigh 40# per square foot, it weighs 40.8# per square foot. It's the weight that's off, not the inch-thickness measurement. If everyone did their calculations and conversions that way, there would be no problem at all. The US normally refers to STS plating by the pound. I am under the impression from this discussion that an STS 40 lb plate is the same thickness as a British 40 lb plate (subject to normal tolerance) even though the two plates are metallurgically different. Is that correct? It should be. A 40# plate is a 40# plate, regardless of the country where it happens to be manufactured. Basically, a 40# plate weighs 40 pounds per square foot. All things being equal, it would typically be about 0.98 inches thick. There are enough American battleships still around, it should be easy to verify this with a ruler. I've seen only one US document that indicates a 24.9mm inch. You will see that most differ by less than 1%. So theoretically a US and a British 40lb plate could be different thicknesses. If you exclude stainless steels the biggest difference is 2% but those are dissimilar steels. Similar ones seam to vary by less than .13% which for 24.9mm ~ .03mm. I wouldn't be at all surprised if the relative densities of British and US armor were even closer. I think that Hi-speed steel (steel alloyed with tungsten, the hardest of them all, mostly used in cutting tools) is around 9. 8.03 is the highest listed on the page I posted. My understanding was that for high speed steel toughness especially with increased temperature was the important factor rather than hardness. The British after WWI decided to comply with the Washington Treaty absolutely. Thus, to prevent the ships from getting heavier than the maximums allowed, they specified NO PLUS tolerance in any steel thickness measures was allowed. As such was really impossible to achieve without drastic increases in the price of manufacture, they simply decided to assume that steel weighed 40 pounds per inch thickness rather than the real 40.8 pounds, and thinned the average plate thickness until this was achieved. Thus, British armor was 40/40.8 = 98% as thick as the nominal inch thickness using the rule-of-thumb conversion of 40# = 1" exactly in most specs which allowed a plus tolerance. For example, British 15" armor, if averaged to that thickness, would have weighed 612 lb per inch thickness, but was usually called out as 600-lb plate as close enough in documents. The use of 600 lb to be the replacement for 612 lb (using 40 lb not 40.8 lb) and thinning the plate until it met that 600 lb true weight meant that the average plate thickness was only 14.7". If any small plus tolerance occurred, it would be under 2%, so the letter of the Washington Naval Treaty was met painlessly. The US Navy didn't care and simply assumed that standard engineering plus and minus tolerances were implied in the Washington Naval Treaty, so the ship might weigh a small amount more than the exact number in the Treaty for that kind of ship and still meet the intent, if not the exact letter, of the Treaty wording. Thus, the 13.5" belt armor in the last groups of pre-Washington Naval Treaty US Navy battleships could range down to 13.25" and up to 13.8". This kind of tolerance was kept in all later battleships, too. Most other nations seem to have more-or-less ignored the Treaty completely and simply stated the ship complied whether it did or not (they couldn't cheat too much in the obvious things, but armor thicknesses were usually not easy for another country to actually measure, so how could anyone prove that they were lying about the displacement of the actual ship?). The British after WWI decided to comply with the Washington Treaty absolutely. Thus, to prevent the ships from getting heavier than the maximums allowed, they specified NO PLUS tolerance in any steel thickness measures was allowed. As such was really impossible to achieve without drastic increases in the price of manufacture, they simply decided to assume that steel weighed 40 pounds per inch thickness rather than the real 40.8 pounds, and thinned the average plate thickness until this was achieved. I think, it´s necessary to stress that the explenation above doesn´t agree well within aviable data. The documented cases for british CA armour predating the Washington Treaties and even predating world war one show 40lbs plates beeing 0.98in thick. Thus it is unlikely that WT has anything to do with metrical differences. It rather appears that when metal is referred to in a specific thickness, then the thickness was adhered to -in within manufacturing tolerances while when armour was referred to in #lbs then weight, not thickness was the reference. That is true for british battleships before and after world-war-one (520lbs belts typically ranged in between 12.5in and 13in instead of 12.75in and 13.25in for nominal 13in thickness). I don´t know how practices were in the USN but I understand that US practice was to refer thicker armour to as in in thickness while thin bulkheads were referred to as in #lbs instead of actual measurement. marcelo_malara wrote: I think that there is a number rounding issue here: a 1 foot square 1 inch thick plate doesn´t weight exactly 40 pounds, but 40.85 pounds, taking a metric density of 7.86 for the steel. So a plate 1 foot square which WEIGHTS 40 pounds, is not 1 inch thick but a little less, 25 mm for the same density. I must conclude that the inch used for the plates is 25.4 mm as in the guns, but it is the plate which is not exactly 1 inch thick. The density of Armor plate is 7.93, not 7.85-6. If a STS Armor plate was actually one inch, or 25.4 MM thick, it would mass 18,712.72 Grams, or 41.25 Lbs. The British defined the "Inch" as 25 MM by law some time back. But I do not know what the status of that is now.